I finished a very random, colorful, spunky (not my style usually) sort of painting. It was messy (literally, my hands were caked with paint). Want to know the secret to this fun texture? 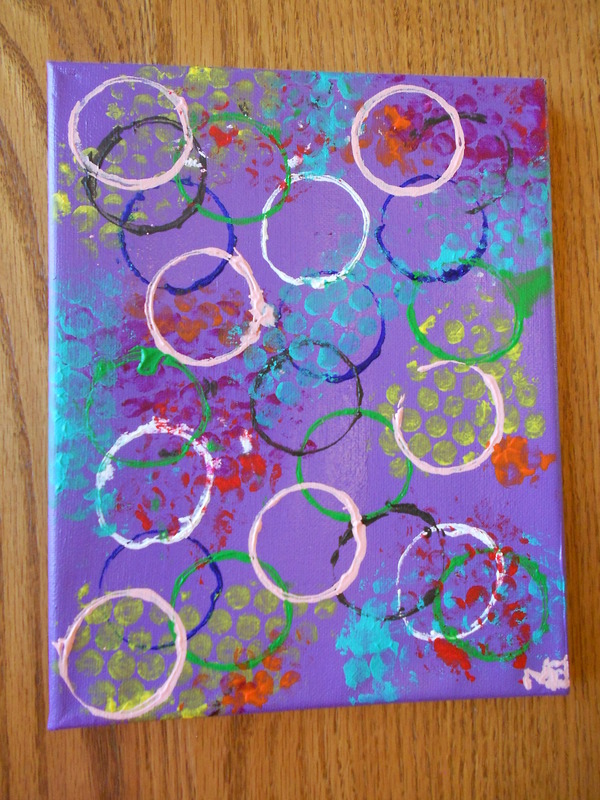 I used toilet paper rolls for the big circles and bubble wrap for the smaller circles. Thank you Pinterest for the toilet paper roll idea and the birthday party art class for the bubble wrap idea. It was one of those paintings in which I had no set goal in mind as far as placement of colors or circles. Purely spontaneous. I thought it deserved a title, so I set out to make one. You lick the back of the paper until the droplet falls off. It is like mastering an art really–too much saliva and you get a soggy paper mess that stains your hands; and too little saliva means you eat the paper and it does not taste good. I remember first being introduced to Candy Buttons when I was in the fourth grade. We were on a family vacation and stopped into a huge candy store in Chicago. I thought they were the coolest thing! I did not see them again until I was a college graduate shopping at Hobby Lobby for painting supplies. “Oh wow! Candy Buttons!! !” I remember being so excited that I bought a few bags. Spontaneous. Then I bought more with the purpose of sharing my candy joy with the kids at the after-school street church I volunteered for on Thursday evenings. As I demonstrated the process of how to eat them, I was a bit timid about how the kids would react. Their faces were priceless. So eager to try this new candy. We rationed out all the Candy Buttons within minutes. Something about this painting also reminds me of cotton candy ice cream (which is one of my favorites, probably because I can actually taste the flavor.) Almost all other flavors, besides chocolate, taste like vanilla to me. That gets bland. 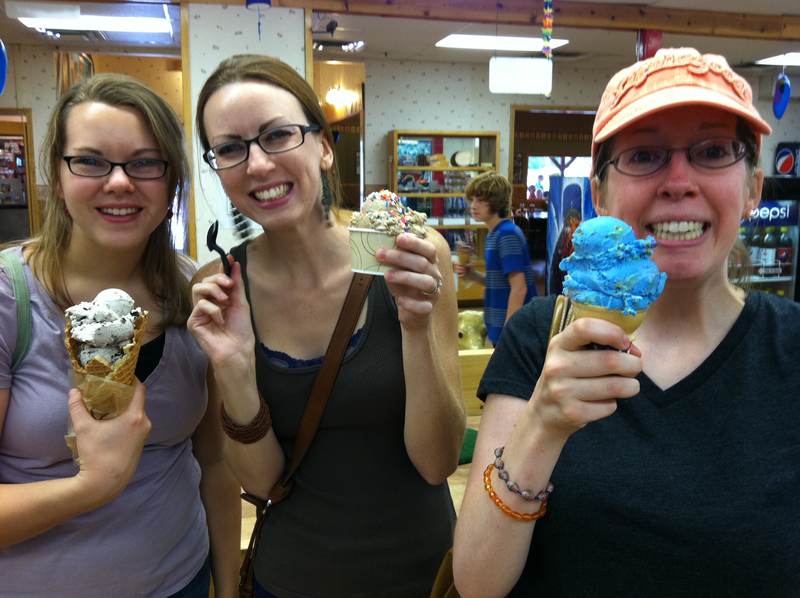 Cotton candy ice cream has a taste of its own. It is unique. And it leaves your tongue blue. 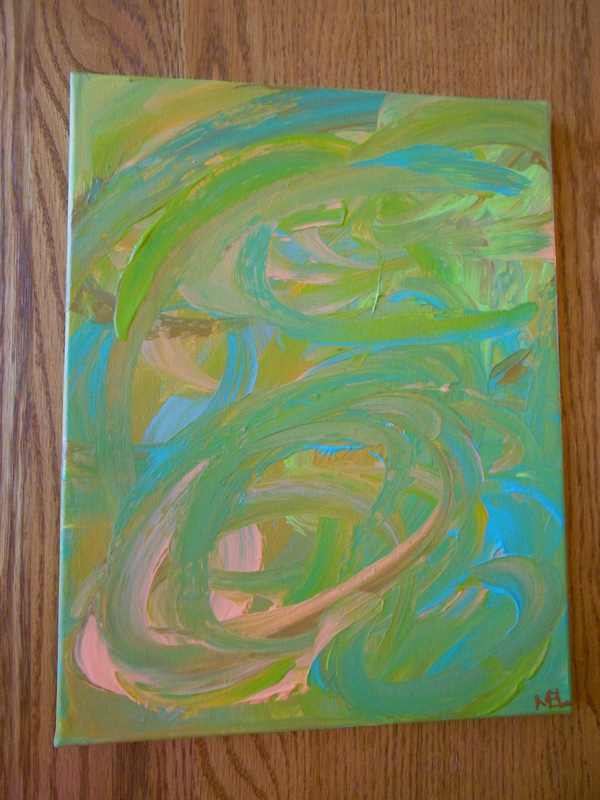 Not all my canvases get titles, but it is an interesting process when they do get titles. I am finding that abstract art often does not need a title. Maybe that is me being too practical. “It is not a painting of anything,” I often say; “Anything” meaning concrete form. And yet, how is it that art at museums have the best fitting titles on abstract pieces that leave you looking deeper into the canvas in search of how the title was formed? It is as if the title should grasp in one profound statement, the essence of the work and still leave a window of opportunity for the mind to expand upon. I don’t think like this. I find that I sit stumped…at a loss for being able to group words together. 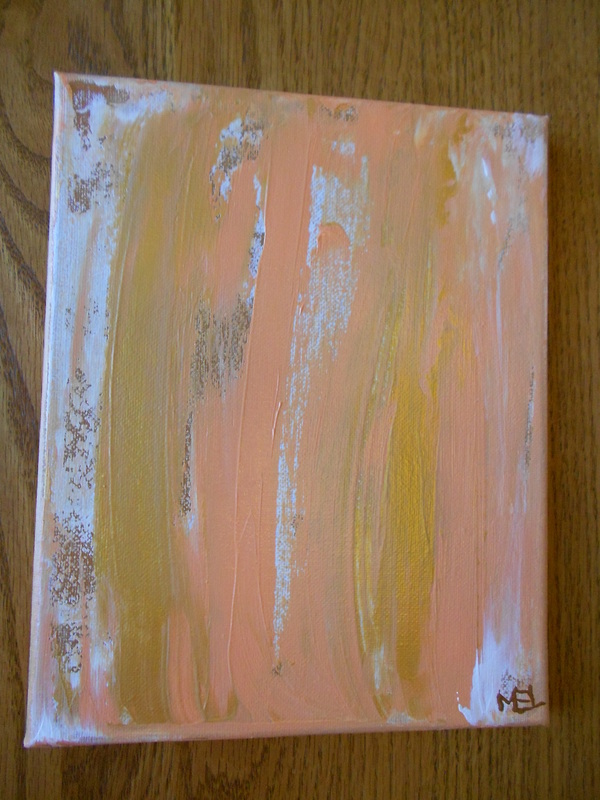 I am currently working on my smaller canvases for the month of June’s display at Beans-n-Cream. But I also have big ideas forming in my mind for my BIG canvases!! I am excited and can’t wait to get started on a few of those as well. In brainstorming, I realized that I need to branch out by creating or trying new abstract techniques. It is a challenge; I think that is why as silly as Candy Fusion may seem…it was different and I enjoyed trying something new. Love the new painting….love purple too and the title:) Have a sweet Sunday! I love them all! Especially the first one! Beautiful! You are so talented in so many ways Mel!!! Thanks Jane! I still have many more canvases to complete, but stopped yesterday to take a “break” and try to think of new artistic designs. I experimented with a few new styles, but want to use my boards wisely too. 😀 I will post a few more pictures in the future! Thanks Negin! I have been having a good time painting new ideas for my canvases. Getting excited for all the opportunities to show my paintings this summer! 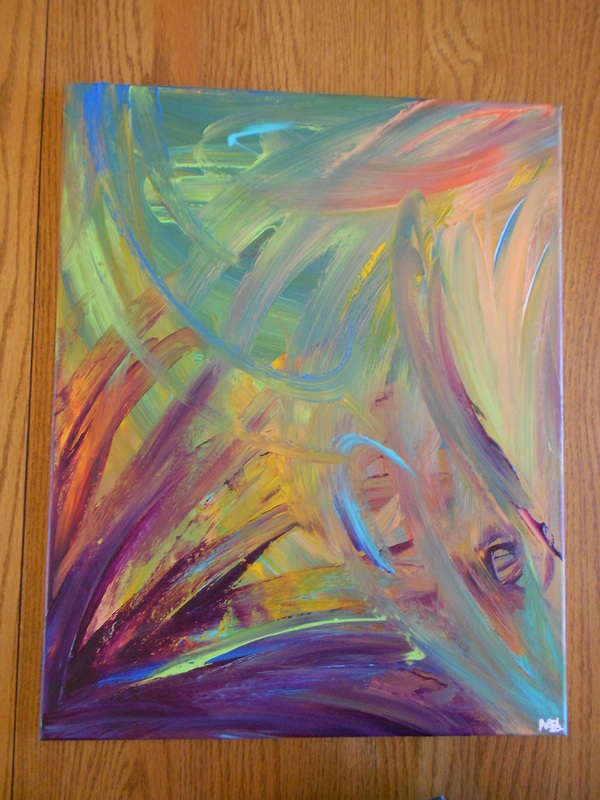 Oh, and I think that’s neat to have pieces where the title is what inspires the painting …. that fire and ice painting turned out great, as did all the rest! !